Contact DNS before signing any contracts and/or deliverables with the NSHA or Government. The below sections are currently the most frequently visited areas of the site. Current features and updated content you should know about. Promoting a strong and trusted image of physicians to the public, DNS showcases the work, expertise and dedication of physicians located across the province. Take a quick guided tour to learn about some of the new features and upgrades we’ve made. The site design is now cleaner, easier to navigate and includes more of the information you want to see. Site navigation is easier and more intuitive. Stay up-to-date: We’ve gathered the latest news coverage of provincial health-care issues. This list of links to the most-visited areas of the site provides quick access to important pages. Find information about upcoming events here. Visit the events calendar for full event listings. Breaking news and important updates for members are featured here. 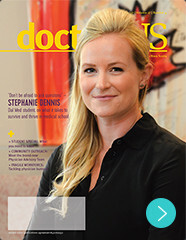 Check out highlights from the latest issue of doctorsNS magazine. Click through to read the full issue.